At some point this year I committed myself to writing at least one blog post a week, because content is king, baby, and because I’m trying to drive people here so that they’ll put an email address into that little red box that’s popping up at the bottom of your screen right about now. That’s so I can send you, dear reader, a free book — like a dealer on a corner giving out samples of their hyper-addictive pharmaceutical wonders so they get addicted to them and have to buy book two. Something like that, at any rate. It’s a whole content marketing thing, like what Bill Hicks used to rant about. I’m going to be honest, sometimes coming up with blog post ideas interesting enough to get people like you onto this page and then entertained enough to click on the free book offer is gosh-dang tiring, dagnabbit. Especially at the tail end of NaNoWriMo, when I need all my energy for cranking out meaningless words I’ll undoubtedly throw away later. Today I’ve come up with endless blog post titles, and then abandoned them all like shopping carts on Black Friday. Don’t lie, how many did you abandon? Since I am a generous person, I thought I’d leave them here, in case anyone else wants them. You know, like someone claiming they’ve left their piss-stained sofa on the front lawn in case someone else wants it, and not just because they don’t want to pay someone else to take it to the tip for them. So here’s ten rejected blog post titles that I can’t be arsed to write but you could if you wanted. Top five remedies for staving off high energy septic anxiety bubbles. Snorkles – myth or monster? Microsoft Powerpoint – History’s greatest monster? Why your assumption that Kurt Cobain wrote Hole’s Live Through This album means you’re a terrible person. All companies that have three letter abbreviated names are evil, probably. Is it better to get your dopamine hit through chocolate or social media and which is worse for society? Ten rejected blog post titles. So, if you’re an aspiring ‘content generator’ and you want to write a post guaranteed to be read by literally ‘some’ people, feel free to use one of these. Or two. Hell, link back here in the comments, if you like. Then we can all cower in the corner, sobbing at the way our lives have turned out. if you’ve felt emotionally connected to one of these titles but you don’t want to write it, why not show your thanks by putting your email in the red box below (you probably already closed it, that’s fine) or by clicking on one of the links that are written in italics below to denote that the main content of the blog post is over now and it’s time for me to sell you something? I love NaNoWriMo, the yearly escapade of struggling writers everywhere where we collectively throw ourselves off a cliff of sanity in pursuit of a 50,000 word count and a printable pdf certificate. This year, since I’m completely new to where I live, I’m doubly looking forward to it. I don’t really know anyone down here, and I know that writers are generally outgoing, personable types, so I’m basically betting the farm on being able to wander into some little coffee shop somewhere and make immediate and lifelong besties of the writing variety. I’m definitely not setting my expectations too high there, or anything. The only problem for me is that it’s all become a bit, well, easy. The last three years I’ve entered November knowing that I’m going to win, not because of some dreadful arrogance, but because the 1667 word count you need to hit is not exactly a million miles away from the 1500 I try to hit every day that I’m working on a draft. It equates to just over an hour of actual writing, which isn’t that much of a commitment, really. Even when procrastination will usually stretch it out to two hours. Last year, I made it with four days to spare and just stopped dead on 50k, completely unmotivated to continue on my draft until December 1st. So, this year, I’m going to try something different. One month. 50,000 words… of short stories. As a writer, I’m always looking to improve my craft, and it’s occurred to me recently that short story writing is a part of my writing vocabulary that’s dramatically underdeveloped. So, I’ve been reading all the advice I can. Bingeing on works as diverse as I can find, and, finally, turning my hand to it. This weekend, after a full fortnight of trying, I finished my first serious short story in over a decade. 2,250 words of overwrought horror that I may well never show anyone. In what’s left of this month, I’m going to try for a few more, and try and come up with a few dozen rough outlines which I can rely on throughout the month of November itself. I may end up failing, badly. At this moment it feels as utterly unsurmountable to me as NaNoWriMo did when I very first attempted it, all those years ago. But, I guess that’s the point. Yes, I’m going to be breaking the rules, but the whole point is to challenge yourself, and that’s definitely what this is going to be. A hell of a challenge. I may end up with 50,000 words of complete drivel, with nary a salvageable story amongst them. But at least it won’t be easy. Here we go again. 30 days. 50,000 words. My sixth Nanowrimo. If you’re not familiar with the concept, National Novel Writing Month is a worldwide competition where people pit themselves against the calendar and try to write the first draft of a novel in a month. It has its detractors (obviously, this is 2016, try and name me anything that doesn’t). It encourages bad writing, it’s led to a glut of terrible books being self-published, it makes most writers around the world insufferable for 30 days and, oh yeah, 50,000 words does not a novel make. There is merit to all of the above, but it somewhat misses the point. Nanowrimo is a wonderful thing, because it encourages writing. The sheer number of people out there who fancy themselves a writer is roughly equivalent to the amount of people currently existing on the planet, going off the fact that the first thing anyone says if you tell them you’re a writer is ‘I’ve always wanted to do that.’ But the mythos of ‘the writer’ perpetuated by the industry is that only a select few, a merry band of joyless scribes, can be that mythic thing… The Writer. It’s a nonsense, of course. They want you to think that because it elevates the work they put into the world, and their place in selecting it. It was the same for journalists, for musicians, for artists of all stripes, until the internet came along and broke all the models, and showed everyone that they could be a creator. The joy of this worldwide phenomenon is that it proves that, yes, anyone can write a book. Or at least, anyone can write a first draft. All you need is to put your bum in a chair, and your fingers on a keyboard, and crank out 1,667 words a day. Easy. The bar for entry couldn’t be any lower. That may sound a horrifying prospect to some, but think of all the voices who we might never hear, given permission to take flight because of an online competition where the only prize is your own self-improvement. This is the key to Nano, for me. If I hadn’t found it, back in 2005, I doubt very much I’d still be writing. Until then being a writer was a nebulous, half-formed thought that only had a few scattered chapters and discarded screenplays as any kind of proof it existed. I don’t even know where I heard about Nano. I was barely on the internet back in those days, but I figured I’d give it a go. To my surprise, I even completed the challenge, and was fairly happy with my story. It needed work, obviously, as all first drafts do, but I’d done it. I’d written a story, start to finish. It was a feeling quite unlike any other, and it gave me a shot of confidence that I maybe, just maybe, could be a writer. It took a decade longer for me to realise the next part of that dream, and have a book in the hands of readers, but without that first step, I doubt I’d have landed any of the others. In the intervening years, doing Nanowrimo has in itself become a more rewarding experience. I’m lucky to live where there is a thriving support group, and the forums remain both an excellent resource and a horribly entertaining distraction throughout November. Oh, and there’s stickers, too. So, have you ever dreamed of being a writer? Met another writer and uttered the immortal ‘Oh, I’d love to write a book, one day’? Well, here’s your chance. You don’t need anything other than an imagination, a keyboard, and a willingness to try. Just go to nanowrimo.org and sign up now. For the past five years or so, I’ve been working on the same story. 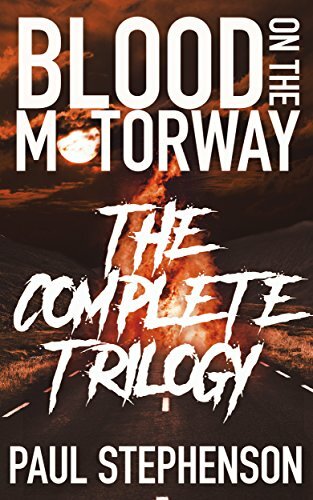 Well, three chapters in the same story, but writing the Blood on the Motorway trilogy has been me playing in one sandbox for the whole time. Same characters, same world, same apocalypse. I love those characters now, and can’t wait to let people see the rest of the tale of Tom, Jen, and Burnett. But, while books two and three still have a fair bit of work left to do (urgh, editing), the writing is done. Now, as November (and Nanowrimo) approach, I’m faced with the prospect of starting something completely new. It is, after five years of safety, a little bit scary. Over the course of the trilogy, the way I write has changed dramatically. For the first book, I sat down and wrote it in a splurge, with no idea where it was going. You can imagine my relief when an ending presented itself, roughly 80,000 words in. If naturally took this to be a sign of my utter genius, and vowed to work the same way until the sun turns supernova and kills us all. For the sequel, Sleepwalk City, I tried the same, but didn’t get quite the same result. Clearly not so much with the genius. It was sheer luck that had seen me through Blood on the Motorway. At the time I was devouring books on writing craft, and story structure, as well as listening to eleven million podcasts on writing. With a slightly broken first draft, I did a few plotting exercises, rejigged the story a touch, and I had something much better to work with on the second draft. My days of pantsing were over. For the third book I had my characters, I had my world, and I had a few plotting exercises that I could use. I plotted the book as I was writing the first draft, and ended up with what I think is the strongest book in the trilogy, a tautly-paced thrill-ride of apocalyptic mayhem that hopefully delivers on the character arcs. I guess the proof will be when people get their hands on it, but it’s certainly the strongest story of the series. Now, I have nothing. Just an idea, one that has been rattling around my brain for a few years. It’s a sci-fi horror, and while the central concept is something I’ve had for a while, I’ve really not had many of the details. So, for the past few weeks, I’ve gone into full on plotting mode. It’s been weird. For years I insisted this was not something I’d do, preferring to think of myself as a Stephen King type maverick genius, from whom stories flow in some kind of curious alchemy. This is the myth of the genius author, right along with the borderline alcoholism and the whole dying alone thing. But it’s a nonsense. As a writer, you have to do whatever works for you, whatever strange brew of tics, targets, plotting, pantsing, deadlines, and coffee that gets you from the empty page to the completed manuscript. Given that this is a sci-fi novel, it’s also a must-do. I’m rather lucky that I know at least two astrophysicists and a marine biologist, who will be able to tell me before I start the first draft whether I’m likely to be laughed out of the room by anyone with even a passing knowledge of that thing called science that the kids have now. I have an evernote folder stuffed with scientific papers, pop-science nonsense, and even stuff on Greek gods. My scrivener folder has timelines, character profiles, political backgrounds and even a full cast list for the characters. I really hope Viggo Mortensen will be available when it comes time to cast the film. So, all told, I’ve gone from one extreme to another. Whether it’ll work for me or not is another matter. I still worry that I’m robbing myself of the spontaneity that pantsing allows the writer, that special frisson of discovering a path you didn’t know existed until it mysteriously unfurled itself. I guess I’ll find out over the course of November and December. Blood on the Motorway – An apocalyptic tale of murder and stale sandwiches, is available on Amazon, iBooks, Kobo and more besides, and until Halloween it's at the reduced price of only 99p!!! Welcome to Discovery Park – the chronicle of my increasingly frustrated attempt to listen to every album on Rolling Stone's Top 500 Albums of all-time list, is available now on Amazon Uk, Amazon.com, iBooks, Kobo, and many more. That was, it has to be said, a stupid idea. I knew full well that November was going to be a nightmare month at work, and yet I decided to commit to NaNoWriMo. Stupid. Work turned out to be far more stressful than I had actually foreseen, and getting across that finish line was like trying to drink sand. But I did it, hence the shiny winners image you can see looming over these very words. 50,008, in the end, with those last 8 words there purely for show-boating reasons, as I danced naked astride my own satisfaction at crossing the finish line. So what did I get out of it? Well, I’ve got the first 50k of a first draft for a second Blood on the Motorway book (try saying that five times drunk), and an immense relief that those words don’t seem to have been a colossal waste of time. The story seems to be pretty robust, if lacking a clear ending yet, the new characters seem reasonably interesting and the amount of peril I have all my characters going through is enough to rival the entire Nightmare on Elm Street movie series. So that’s fun. I reckon there’s another 30-40k left in the first draft, and that the final book will probably be a bit longer than its predecessor will shake out at. At the end of the month, what with all the being on the brink of total mental collapse, I decided to take December off from writing. Next year should be a pretty big year for my writing, seeing as I’m planning to launch a business and three full length books at the end of it, all while getting married and getting fit, so I thought it might not be a bad idea to ease off a bit at the end of 2014, take stock, and plan the year ahead. I’ve not really stopped though, when you take into account the planning bit. I’m actually really excited for next year, and having made the decision to go down the ‘indie author’ route (I’m no longer calling it self-publishing because of that wrinkled up face of concern at my mental well-being that so often follows it) I’ve been planning out the various milestones I need to hit in order to achieve that. I now have a google calendar set up with all the different things we need to plan next year put on. If I can say I’ve learnt anything from my job, it’s the value of project planning. So for the next few weeks I’m going to be enjoying the whole Christmas malarkey, but I’ll also be gearing up, getting myself in the right mental frame of mind to spring into action in the new year. With only a few days left before I actually start writing the sequel to Blood on the Motorway I thought it might be an idea to start on the process of plotting it out, or at least working out some of what I’m going to be writing about, so that I don’t find myself writing all my characters down a dead end. This is, however, proving slightly harder than anticipated, although I have managed to come up with a working title that made me chuckle: Blood on the Motorway 2: Motorway Harder. Oh how I chuckled to myself. The reason I wanted to press ahead with a sequel instead of a new story was fairly simple. I know the characters and I know the world, so given both of these things I should be able to get back into things a lot quicker than if I was creating a world from scratch. I also came up with an idea for an opening chapter that had a real kick to it and should get it going really well. The problem though, is that this is not enough. Sure, I have my characters. I know them pretty well by now, and know how they’d react in a crisis, having put them all through a fair few of those in the first book. I’ve got a couple of new characters in mind, and plans to expand a few of the characters from the first book. That’s fine. I’ve also got the setting. Blood on the Motorway is set in a pretty specific version of the apocalypse, so any world-building is limited to seeing how the situation has deteriorated since we left the characters. The first book is supposed to be a fairly breathless page turner so I’m aiming to let things breathe a little more here as the characters come to grips with the new reality they’re in. So that’s also fine. What I don’t have, however, is the story. I have a world, I have people, but I have no idea what the driving force of this story will be. What are our characters up against? What is their goal? I am really really stumped on this and aside from a few chapters of getting to know you again kind of stuff, I’ve got nothing. So I go into NaNoWrimo in three days with a very big question mark over my head. I need to answer the question of what kind of story it is. The first book is apocalyptic, yes, but it’s also a horror story, and a crime story. But robbed of the antagonist from that tale, what am I going to do with my characters this time around, save for having them stand around talking about where the next meal is coming from for 80,000 words? I mean, I know Cormac McCarthy did that, but he was able to do that because he’s Cormac McCarthy. I most definitely am not, no matter how much I wish I was. The first book was a very purposeful melding of genres, so that’s something I’d like to do again with the second (and the third, which I do kind of have a direction for), but I don’t really want to re-tread the ground covered in the first book. I also don’t want to take it in a direction that betrays the first book entirely. I’ve had some vaguely science fiction-y ideas for what could happen in this book, but each one of them would feel like a bit of betrayal of the grounded reality of the first one. I could very easily find myself pole vaulting the shark if I go down that road. I think that as much as I didn’t want to, I’m going to have to ‘pants’ this one, and just start it and see what happens, unless inspiration hits me in the next few days. We’re heading into the last few days of October, which means that unlike most of the internet I’m not endlessly googling pictures of skeletons, but instead panicking about my decision to attempt NaNoWriMo again. I don’t seem able to shake the plague that my children have ever so kindly bestowed upon me (I don’t have proof it was them, but I’m assuming it was, with their shifty little plotting eyes, always trying to find my weakness), and I realised that I’ve invited my parents to visit this weekend. This means that rather than getting a hefty start under my belt with the fortuitous placement of a weekend at the start of the month, I’ll be heading into day three with probably zero words, and a working week that’s looking more and more stress-laden with every day. Oh, and I’ve done precisely zero plotting work on it due to the aforementioned deathly plague. Basically I’m screwed. I went to a local NaNo group kick off party yesterday, however, and I don’t think I’m alone in feeling these levels of dread. I turned up two hours late, made everyone feel uncomfortable for a bit, burnt my mouth on my coffee due to my social anxiety and then tried to convince everyone there that I must be a representative of Scrivener by blathering on about it for twenty minutes. But it was nice to meet some more fellow authors; perhaps next time I’ll arrive on time for it and get to speak to people better. Deep breath. I can do this. November approaches, and once again I’ve decided to throw my hat into that rather bizarre ring marked ‘NaNoWriMo’ in large blue letters. This will be my fourth attempt at the ever-popular writing contest, which I’ll be undertaking again despite the relative failures of the first three attempts. My own personal history with the competition is chequered. My first entry came when the competition was quite young, a tale of a psychic boy and a serial killer that was, as far as I can remember, quite good. Unfortunately I wrote it on my then-girlfriend’s laptop, it waited for me to finish the whole 50,000 words and then promptly died, taking the manuscript and quite a large collection of illegally downloaded mp3’s with it. That was a fun day. My second attempt actually provided some of what ends up in Blood on the Motorway today, but not really, because it’s now a completely different book. That first attempt was awful, as evidenced by the fact that it’s taken me the best part of a decade and at least three complete re-writes to salvage a book out of it. It started out as a road novel attempting to dissect the death of youth culture in Britain, but then I realised that youth culture hadn’t died, I’d just gotten older (awkward) so now it’s an apocalyptic tale of murder, because realising the death of my own youth compelled me to write the end of mankind. The third book was quite a good idea, which I’ll probably try and return to one day, a sci fi horror hybrid set on the ice moon of Europa. But if the idea was half decent the execution was utterly horrible, to the point that when I hit 50,000 words in the middle of a chapter (with a good few chapters to go) I just stopped, verified my winner’s status and moved it into a folder which I will never open again. And now I’m taking another bite at the apple. Sure, I should have learnt my lesson by now, but clearly I haven’t. Hopefully things will be a bit better this time around. Now, I’m writing a sequel rather than original story, so I’m working within a world I’m much more familiar with, and with characters I know pretty well by now. Also, I’m attempting this now as someone who has learnt an awful lot about how to write a book through the good, old fashioned method of trial and error. And error. And error. My big mistake with the two that didn’t work was relying too much on ‘pantsing’ my way through the plot, without giving due care an attention to the concepts of plot vs concept vs setting. I might have my setting, and I’ll leave my plot to work itself out, but I definitely need to work on my concept before I start. I have my characters but what is it they’re doing in this story? What are they fighting against? What do they need to overcome? In short, what is the tension. I have two weeks to work that out, but it’s something I’ll definitely aim to have sorted by the time I sit down on the 1st to start writing. Still, I’m pretty excited. It seems like there’s a lot more to NaNo than there was last time I did it. Then there was a local group but it was quite small and I was too skint to go to spend an afternoon in a coffee shop so I was mainly tackling it on my own. Now it seems like there’s a pretty large local support group I can go write with, but I also have my online writers group, an entire shedload of whom are doing NaNo this year. So November will (hopefully) be insanely productive and a hell of a lot of fun, if I can just get through the thing without developing a rash every time I see the number 1667.